For a while in my free-wheeling days, I lived on a sailboat with my husband. We sailed from Maine down to Florida, over to the Bahamas down as far as the Tropic of Cancer. Then we turned around and sailed back. We made this mini-circumnavigation twice, putting about 12,000 nautical miles under our keel. Our yacht was a 37' Tayana with a full keel and 12 feet of beam. 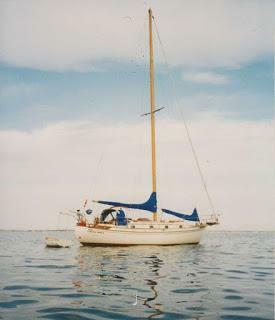 She was a study boat, and a pretty one, with a wooden mast and lapstrake style fiberglass and a wooden bowsprit. Needless to say, we encountered all types of weather and all kinds of marine conditions. Storms, believe it or not, are not as hard to deal with as one might think. Boats are made to bob and yaw and pitch and really are in their element when it's storming and you are underway. The one that gets hard to deal with is current. But more on that in a moment. One of our elders who delivered the confession time devotional in the worship service on Sunday mentioned his above ground pool. He said it is a small pool, and that you must circulate the water because it's better for the water and better for the pool. What he does to circulate it, he said, is walk rapidly around the perimeter of the pool while in it. That gets the water going. Around and around he goes, the water as a force swirling. If you turn around, he said, you suddenly feel the force of the water against you. When you're going with the current you don't feel it, but turning around suddenly this wall of water pushes against you. This got me thinking about ocean and river currents. When I lived on the sailboat, we traveled down some of America's mighty rivers, like the East River, Potomac, the Cape Fear River, or the Savannah River. The currents on these rivers are very strong. When traveling against the current, the current wants to push you off course, and can do so very easily unless you maintain constant extreme vigilance. The engine works hard, you have to hang onto the steering wheel pretty tightly to maintain course. If you lose the engine, you end up on the rocks. You anxiously keep looking at the time, waiting for the tide to turn so the current will ease up. It's so much easier sailing with the current. You cruise along, carried by the current in its course, enjoying the lack of turbulence. The two years of sailing as a live-aboard cruiser are still reaping benefits in spiritual insights and life metaphors. I'd often wondered why the Lord would send me on such an amazing journey (now that I know the Lord). His providence is amazing. Because He ordains everything in a person's life down to the last dust mote, there had to have been a reason He sent me down America's coast in a boat. I didn't know Him then, but I do now. And I know there is a reason. There may be many more I'm too dense to comprehend, but the spiritual lessons keep coming. I'm not an agricultural person, so the sheep and the wheat and chaff and such don't resonate with me. But the marine symbols do. When the writer of Hebrews says cling to your salvation lest you drift away, I know. When Jude says there are hidden reefs at your love feasts, I know. When Paul says do not make a shipwreck of your faith, I know. I hope you caught the life-lesson I'm about to reveal. The current is the world, it sweeps you along and you do not notice any turbulence...until you turn 180 degrees. When you turn (repent), suddenly the force of the current is quite noticeable. It pushes against you. The world wants to direct your course, and if you don't have an engine, you're headed for the rocks. The engine is the Spirit. You have to grip the wheel tightly so as to stay on course. The wheel is the Bible. You have to maintain constant vigilance or you will be pushed to where you don't want to go. Here's the difference. As opposed to a mariner's life, in Christian life- the tide never turns. There is never, every a season of ease. There is never a time when you can safely coast along. There's never a time when you don't need to constantly be vigilant and check your course. As long as we're in this body, we have to remain at the binnacle steering this ship of faith against the current of the world that always pushes against us. When the time comes in each of our lives to let go and swim the River Jordan, we will emerge on the other side climbing up the bank victorious. Of course, it is not our victory. Jesus swam against the current of the world all His life and was never shunted off course, never drifted an iota into dark waters, not even when He was tempted by the devil. He kept His eye firmly on the lighthouse and the glory of God. He gained the victory because of His righteousness, and imputed it to us. Buck the current. Stay vigilant. Have a firm grip (hold fast) to the steering wheel. We will eventually make it to safe shores and we will never have to slog through an angry tide again. All will be peace, calm waters and safe harbor.